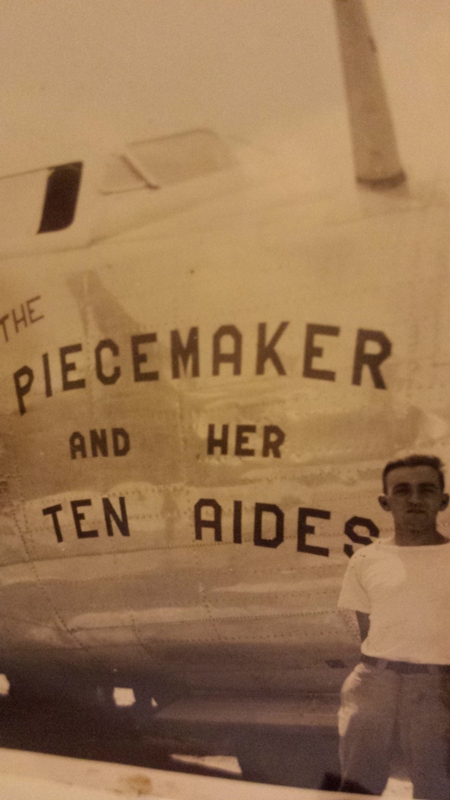 My Dad’s B 24 crew. He is in the front row, third to the right. Around 6 years ago my Dad agreed to let me interview him about his war experiences. When I arrived in Longview he pulled out a manila envelope. Inside were his WW II dog tags and copies of his flight logs. I’d seen them before as child when my sister and I would sometimes rifle through his battered foot locker while playing in the attic. Like many of the baby boomer generation I grew up bored of hearing about WWII. I had no idea what those papers, his crushed hat and other mementos represented. It was years before I got it. My dad had lived through tough times. As another Veteran’s day rolls around I wish to express my gratitude to my Dad for his sacrifice and those made by all veterans past and present. Below is my father’s war story using his own words. His hat must have been lucky indeed, for 66 years later he was still alive to tell me about it. My Dad, Roger Verle Caple, grew up during up during the Great Depression. Upon graduating from High School in 1940, he had no dreams of college, he wondered if he’d even find a job. But the wheels of war were already turning. He found work at the Bremerton, Washington naval yard and by living with his sister he’d saved enough money to go to college the following September. He was alone studying for finals on December 7, 1941, the day Pearl Harbor was bombed. By his next birthday he was eligible for the draft. The Army Officer Aviation Cadet program offered a deferment, so he signed up. By the end of winter quarter, orders to report to Fort Kerns, Utah for basic training had arrived. His father took him to the train depot, on March 26th, 1943. At a cadet classification center in Santa Anna, CA. “…. we underwent more tests for reaction time, coordination and written tests. Then it was on to pre-flight training at Ellington Field, Texas. He was there on July 27, 1943 when a storm dubbed the “surprise hurricane of 1943,” struck. Winds, at the storms height, were clocked at 120-130 MPH. For a job well done he was given the week-end off. And since his father was visiting it enabled them to spend a little more time together. It would over a year before they’d be able to see each other again. In September, he was transferred to Hondo, Texas. My Dad at age 21 near the end of 1942. Almost a year after starting basic training, he was stationed at Mitchell Field, Long Island, NY, as the navigator for a combat replacement crew headed to Europe. 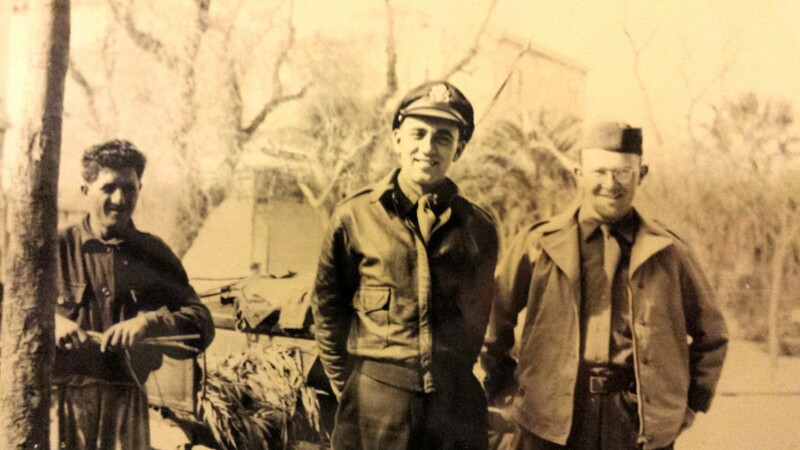 On March 31, 1944 they flew it to West Palm Beach and from there embarked on their journey overseas. Their trip took thirteen days and sent them to South America, over the Atlantic and to Africa, finally arriving at San Geovani Field, Italy on April 14. 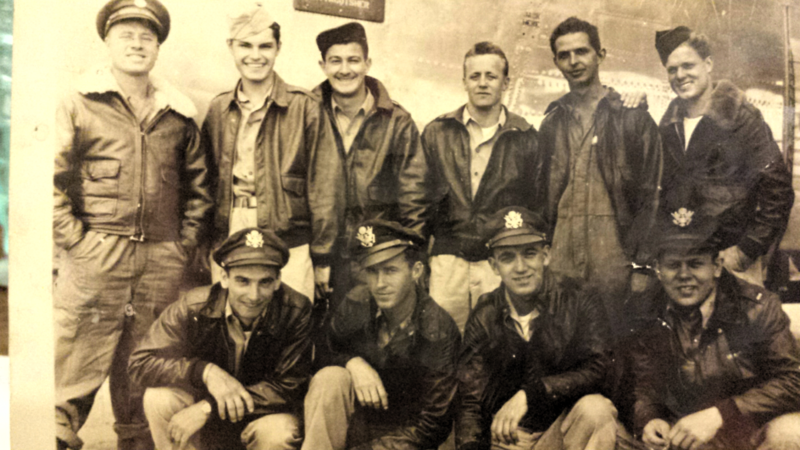 They were assigned to the 455th bomb group and 743rd squadron. The base was about five miles from the city of Cerignola. 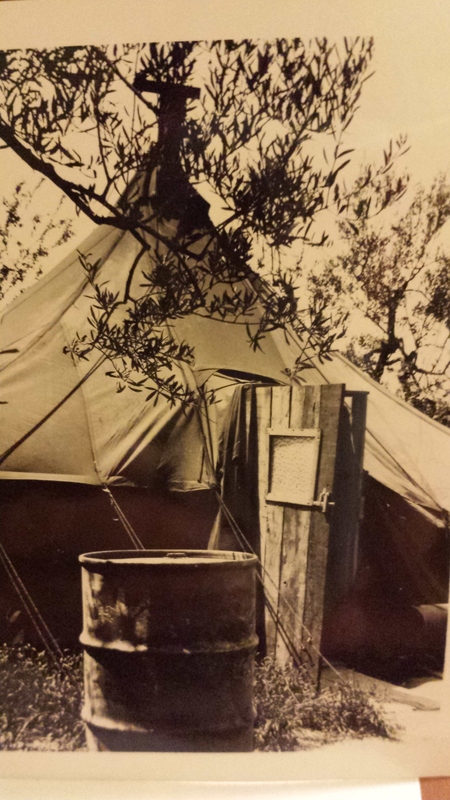 My Dad’s living quarters in the olive orchard. The base had few comforts to offer. The weather was still cool. 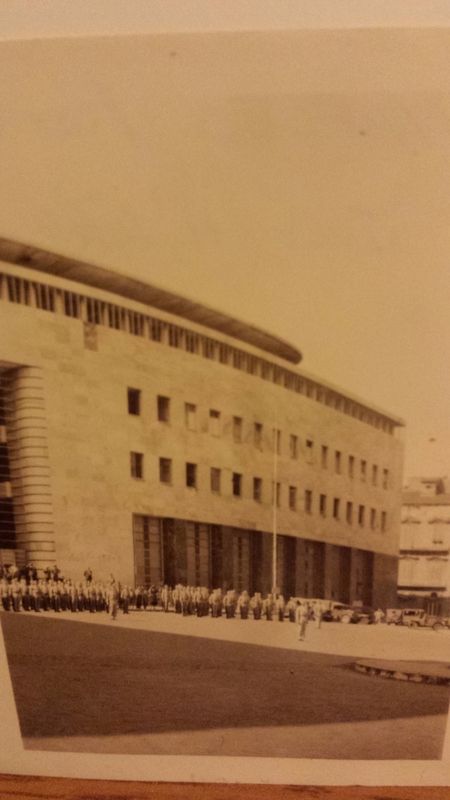 Italians workers did the KP duties. A young Italian boy named Matt ran errands for his the crew. There wasn’t much to do there when you weren’t flying my Dad told me. On non flight days, he said, they were also free to go into the nearby towns during daylight hours. Taken on one of his trips to Fogia. Days later they were still picking up body pieces. They were also disappointed to learn that they would not get to keep the plane they had flown over. On mission days my Dad was awakened between 2-4 A.M. First there was a briefing to attend. Once in the air the crew would put on oxygen masks. The temperature while flying at high attitudes dipped below freezing even in the summer. To stay warm the crews wore electric suits under their clothes. I asked if he remembered how he felt on his first mission. Knowing eventually about 50% of the planes wouldn’t return to base and of those 25% lost their crews, I asked my Dad if he was ever afraid he wouldn’t return. His reply surprised me. He told me that during his stay in Italy his crew never suffered a loss or injury, but the squadron lost 6 planes, and the group 29. His confidence would be tested many times. The first was four days after his first mission.Their destination was Bucharest, Romania and their group lost 4 planes that day, but none from his squadron. I asked about the skill of the pilot. Had he been a factor in their survival? My Dad said navigation in B-24’s was done by visual sighting or dead-reckoning. The hardest part of being a navigator he said, “was being responsible for knowing where you were. If you were in formation, you just followed the lead plane. But almost every mission someone had a malfunction and had to go back all alone. That happened to us 5 or 6 times. I asked my Dad if he had ever manned the turret guns. His most frightening mission was one they made to an oil refinery outside of Vienna. “Another mission I‘ll never forget was the one a ME-109 jumped us. He never came in front. He was on the side. He must have been the worst shot in the air. We probably had several near misses. We’d left the mission south of the Alps on the way to Munich. We had had to feather an engine and were probably flying at an altitude of 17,000 or 18,000 feet. Our pilot dove to 500 feet when we were over the Adriatic to evade him. I did see it when it was off to the side…..We weren’t sure but I think he was hit. I last saw some smoke coming out of the rear of it. The 15th Air Force rotated crews back to the U.S after 50 missions. Some were also selected to go home half-way through their missions with the understanding they would return. They were sent to Naples on July 10th. There Dad’s orders were changed to a permanent return to the U.S.
About a week later they boarded the “Henry Gibbons,” an army transport ship. 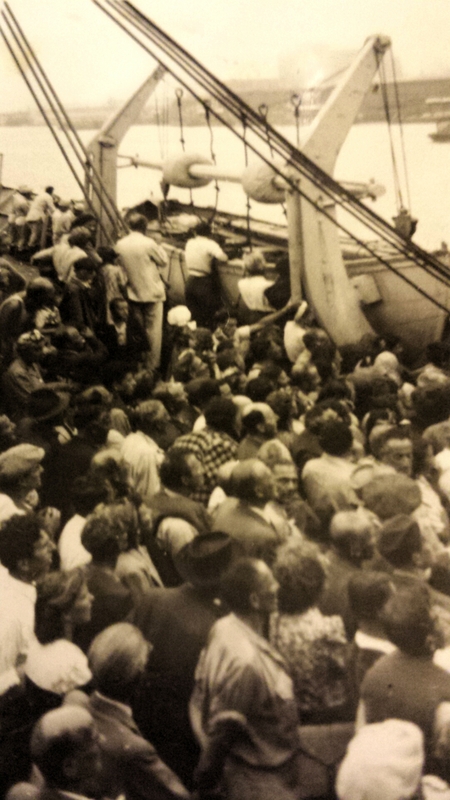 Once on board my Dad soon discovered there was also a large group of refugees on the ship. Most were Jewish, most were professional people in their pre-war life and all had managed to escape internment in concentration camps. They were also the only group of refugees the U.S. government allowed to enter the country during the war. On a foggy Aug 3rd, the “Henry Gibbons” sailed into New York’s harbor. After a 3 week leave he reported to Santa Monica Ca for reassignment. In May of 1945 he was transferred to the Air Transport Command assigned to ferry planes back from England, in Long Beach, California. He took advantage of the free time by exploring LA. He enjoyed going to ball games and dancing to big band names. Shortly after the war with Japan ended he was discharged. Four years after the bombing of Pearl Harbor my Dad once again was attending classes on the University of Washington campus. I asked him, if the war had changed him. Finally, I asked, did he have final message he’d like to leave about his war experience for future generations? This entry was posted in Uncategorized on November 10, 2015 by kwriter13. Thank you for sharing this story about your Dad. I had no idea of his service during WWII. 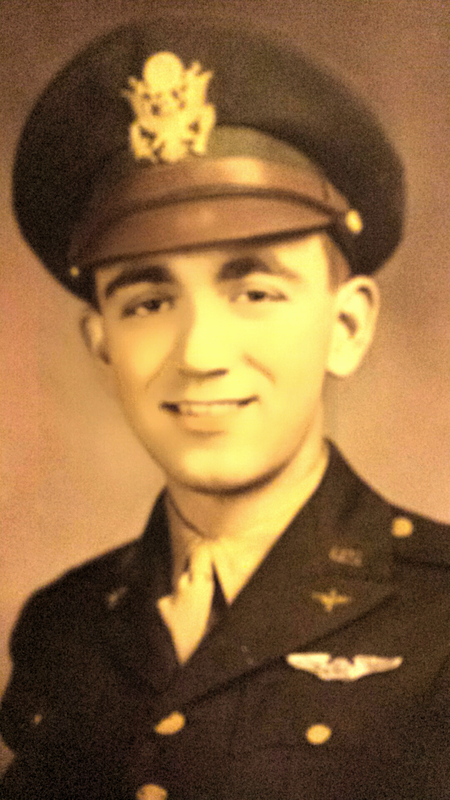 He is in my memory along with my Dad during this Veteran’s Day. Their service did matter.